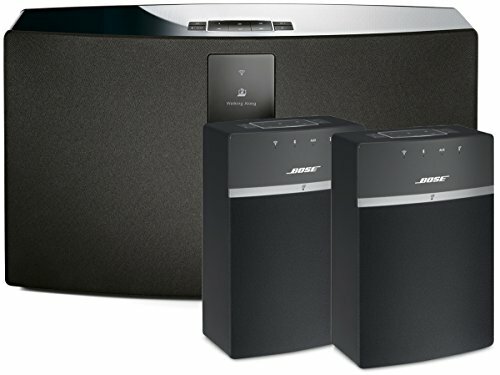 You save $40 by purchasing two speakers as a bundle rather than individually! Pair more than one speaker to play the same music, or allow them to play their own separate tunes in different rooms! Connects wirelessly to your home Wi-Fi® network or Bluetooth device without any complicated equipment. Spotify®, Pandora®, iHeartRadioTM and Deezer are integrated into the SoundTouchTM app to make it even easier. Also, choose from thousands of Internet radio stations and your entire stored music library. This bundle includes one black Soundtouch 30 and two black Soundtouch 10 wireless speakers which can be paired together to play the same music or played independently. There's a world of music out there. And the SoundTouch wireless music system is the easiest way to start playing it throughout your home. It connects directly to your home Wi-Fi® network without any complicated equipment. Plus, it's so small, you can place it just about anywhere to stream music with full, rich sound. It's part of an entire family of wireless products. Start with one, and add more whenever you want to play music throughout every room of your home. A free, powerful app lets you explore millions of songs from music services, Internet radio stations and your stored music library. And only with SoundTouchTM can you play any of that music instantly, without a phone or tablet. Simply press one of six presets on the speaker or remote, and your favorite music starts.